SEOUL, South Korea — Researchers at the Center for Quantum Nanoscience (QNS) have made a major scientific breakthrough by detecting the nuclear magnetism, or “nuclear spin” of a single atom. In an international collaboration with IBM Research, the University of Oxford and the International Iberian Nanotechnology Laboratory, QNS scientists used advanced and novel techniques to measure the nuclear spin of individual atoms on surfaces for the first time. In the longer term, researchers at QNS want to store information in the atom’s nuclear spin. Last year, the same collaboration succeeded in storing, reading and writing a bit of digital information using the electron spin of only a single Holmium atom. In the same manner, nuclear spins could serve as bits at the subatomic scale. The team also plans to use their technique to test pathways for quantum computation. While still in early development, quantum computation promises to vastly outperform classical computers in tasks such as database management, search, and optimization. Nuclear spins are excellent candidates for these quantum bits, since they are well-isolated from the environment through the atomic shell, a requirement for quantum information devices. The Center for Quantum Nanoscience, housed on the campus of Ewha University in Seoul, is a groundbreaking research center merging quantum and nanoscience to push the boundaries of human knowledge in basic research. 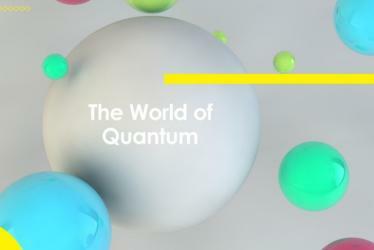 Backed by Korea’s Institute for Basic Science, which was founded in 2011, the Center for Quantum Nanoscience researches the quantum-coherent functionality of atoms and molecules on surfaces; exploring the potential of the smallest building blocks that humans can use to create engineered quantum systems. Led by world-renowned physicist Andreas J. Heinrich (A Boy and His Atom, IBM, 2013), QNS is dedicated to bringing top scientists from around the world to their state-of-the-art facility in Seoul to conduct research that will unlock the secrets of the quantum universe. Philip Willke et al. Hyperfine Interaction of Individual Atoms on a Surface, Science (2018).